Refinishing cabinets was not something I thought I could do, but I have been glaring at the builder grade oak cabinets in my bathrooms and kitchen since my husband and I bought our home nearly five years ago. 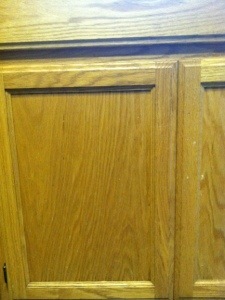 You know, the cabinets that scream 1990’s? Replacing the vanity, moving, or winning the lotto weren’t in my future, so painting or refinishing the cabinets was my only option, there was no way I was going to go another weekend with those cabinets! After reading and seeing the amazing testimonial pictures at cabinets.rustoleumtransformations.com I knew Rust-Oleum Cabinet Transformations was my best bet for this project. The kit sells for about $80 at home improvement stores; which may seem pricey, but when you take into consideration the cost of buying all the components of the kit separately and the square footage the kit will cover, it’s a pretty good deal. I have enough left over to eventually “transform” my master bath and then some for other refinishing projects that may come up. What you need to know before refinishing your cabinets. 1. At the home improvement store, you must select the finish you want and have the paint department mix the stain, I selected the dark espresso finish. No returns once the stain has been mixed. You will need rubber gloves, paint brushes, a small roller, paint tray, and painters tape. 2. Watch the instructional DVD, it is worth your time. 3. Start your project in the morning. You must wait for the primer, finish, glaze, and wax to completely dry before starting the next stage. I got impatient with the second coat of finish and had a lot of touch ups. 4. Plan on two or three days before your cabinets are transformed and ready for use. 5. Carefully label all drawers, doors, and hardware. Make a diagram and keep everything in order; I didn’t and I had quite a time matching hinges! 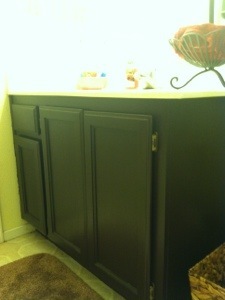 I am pleased with the results of my refinished cabinets. My next step is to change out the hinges and add drawer pulls to the cabinets. The bathroom looks so much better! Are you considering refinishing cabinets?